Warning: Do not rely on GPS navigation. HAPPY TRAILS…We look forward to having you as our guest!! From San Fernando Valley: (scroll down for directions from the westside and Ventura) Take the 101 North or West (depending upon your entrance point.) Proceed approximately 8 miles past the 405 freeway…. 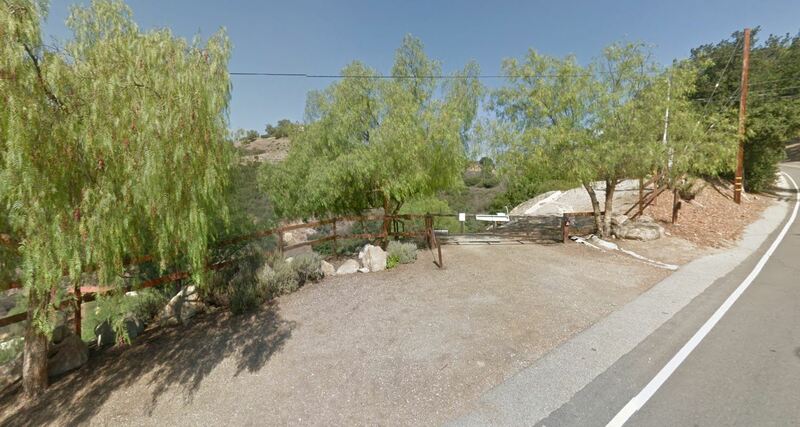 Exit at VALLEY CIRCLE / MULHOLLAND and turn LEFT to go SOUTH at the top of the exit ramp. (you will see a Haggen Grocery store and a McDonalds on your left and the Motion Picture Retirement Home on your right. Continue forward, and you will pass a Taco Bell on your left…..) Take a RIGHT on VALMAR (this is a traffic light) Valmar will turn into Old Topanga Canyon Road within a few blocks. At the end of the road, at the light, you will turn RIGHT onto Mulholland Hwy. (Wild Walnut Park will be on the corner to the left.) 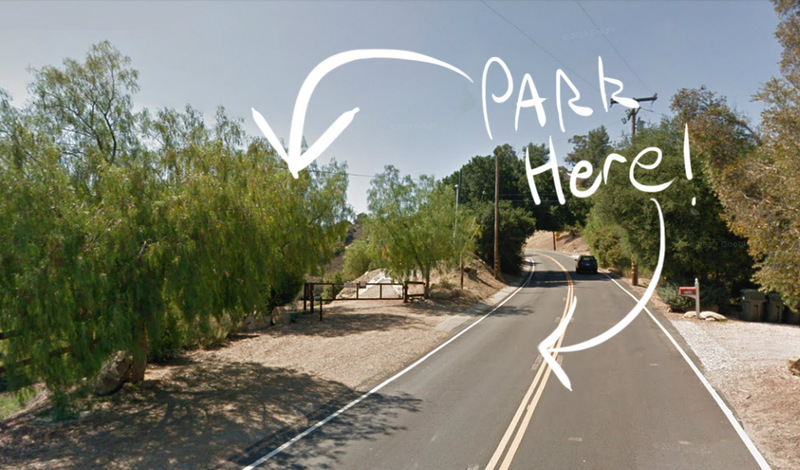 You will turn left (there is a left hand turn lane) to continue on Old Topanga Canyon Road. Travel 1.7 miles up the canyon. 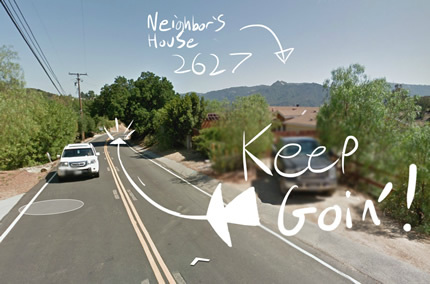 When you crest the canyon and begin going downhill, look for a light-yellow housewith a wooden gate and trees on your RIGHT with address 2627 . (It is important that you are looking for the address and not a sign or horses. We do not have a sign posted with our ranch name and the horses are not visible from the road. Drive past the house… and park on the dirt turnout on the RIGHT side of the road. There will be a 2-rail wooden fence, landscaping rocks and an address marker. From Santa Monica Area: Take the 10 freeway WEST to PACIFIC COAST HIGHWAY (PCH) and go NORTH. Take PCH North past Sunset Blvd. to TOPANGA CANYON BLVD., turn RIGHT Take Topanga Canyon Blvd. 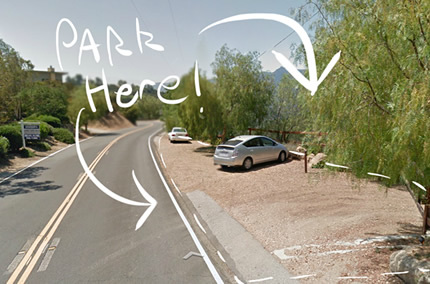 to Topanga Village (small shops and restaurants) At the post office, Turn LEFT onto OLD TOPANGA CANYON ROAD. Proceed 3.9 miles up OLD TOPANGA CANYON ROAD. (You will pass Mill Creek Equestrian Center on your left – that’s not us – please go up further. ) As you crest the canyon, start looking to your left for address 2627. It is important that you look for the address and not a sign or horses. There is no sign with our ranch name and the horses are not visible from the road. On the LEFT, You will see a dirt turnout with a 2-rail wooden fence, landscaping rocks and a tree with an address sign (2623) in front of it. Park here!! From Ventura, Westlake, Thousand Oaks, Moorpark, Agoura etc: Take the 101 freeway South or East (South and East are the same direction), exit Mulholland Drive/ Valley Circle off ramp. This off ramp forces traffic to a stop light. This will put you in front of “Motion Picture and Television” building. Turn LEFT at this light. Go one SHORT block (stay to the right!) and turn RIGHT at Mulholland Drive. At Valmar (second light signal) turn RIGHT. Valmar becomes Old Topanga Canyon road within 2-3 blocks and dead ends at a stop light which is Mulholland Highway. Turn RIGHT onto Mulholland Highway. Go one short block to Old Topanga Canyon Road. There will be a LEFT turn lane for it. Turn LEFT here. 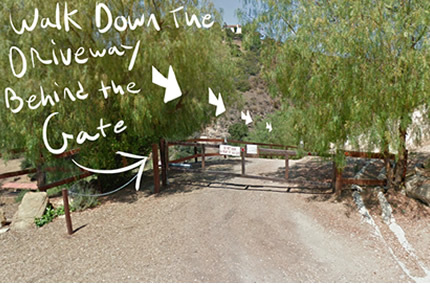 Go UP Old Topanga Canyon Road 1.7 miles to our location. When you crest the canyon and begin going downhill, look for a light yellow house with a wooden gate and trees on your RIGHT. (If you start going downhill around a sharp bend, you have gone too far.) This yellow house is 2627 Old Topanga Canyon Road. (Slow down, you’re getting close!) You are to pull past the house and you will see another address sign with an arrow pointing down our driveway that says horse ranch. Park Here!!! Do not block the access to our driveway or block in another car!! PLEASE… DO NOT drive down the driveway through the gate. The gate will be closed. Do not open the gate, we like it closed. You park your car at the top and walk down the driveway. If you try to drive down the driveway, you will be stopped by the ranch staff. Odds are you may get stuck and not get to ride because you’ll be dealing with a cranky tow truck driver. Pssst…Please pass this on to your guests ahead of time. Much appreciated!